Anyway, that has all resolved now and I still have a heap of cool bits and pieces (well, cool to me anyway) sitting in the garage so it's time to think about going fast again. I have been working feverishly on a motorcycle that includes a heavily modified holden 253 V8 mounted sideways in a custom built frame with a direct drive through a clutch on a jackshaft. My intention was to drag race it however it seems it runs afoul of the rules for that kind of thing so I though perhaps I could re-enliven my dream to run on the salt. The DLRA rulebook confuses me a little though. All the engine classes for motorcycles make some kind of reference to a "motorycle" engine, which I assume means this is where the engine must have origniated. The only exception is for streamliners where it is specified that any engine using the otto cycle may be used in streamliner category only. I was thinking of building the bike with partial streamlining but leaving it still a 'sit on' motorcycle and it would seem there isn't a class for this if I read the book correctly. Oddly enough there is provision for APS bikes to run in the Omega class so if I understand correctly it could run with a helicopter turbine but not a car engine? One thing that makes me think I may have this wrong is the V8 bike of Chris Fraser which ran in 2004 and 2005. I don't know if it posted a record in a class or was run for 'time only' however this same provision relating to unlimited otto cycle engines was in place back then too. Can a motorcycle powered by a pushrod V8 engine from a car run on the salt at all, and can it post a record in a class?? As always any assistance would be greatly appreciated. Time only will do me. Not overly concerned with accolades. Just want to ride the thing. Here's a couple of pics just to give some idea of what I'm doing. Just to be clear I don't expect anyone to assess the safety of the design from these pics. Just posting in case anyone is interested. The new design is a little lighter in construction but includes a custom steel intake manifold which a short backbone bolts up to for increased rigidity. 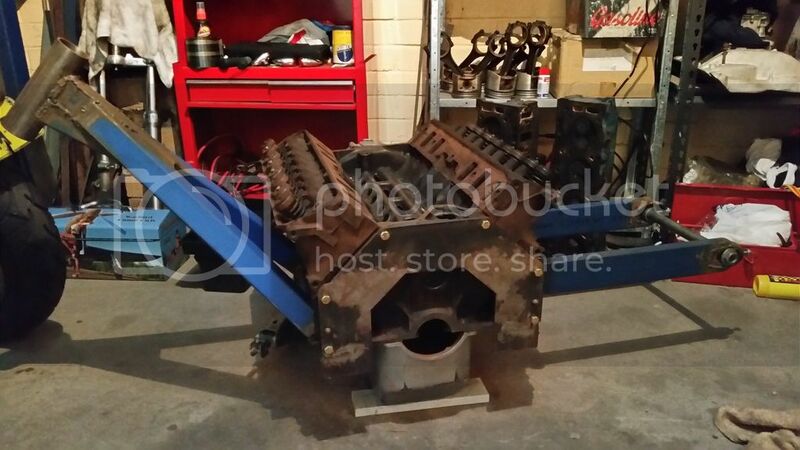 The manifold is currently in the early stages of construction and is a bit of a slow process. Going to be a long reach to the bars? It is on that frame. 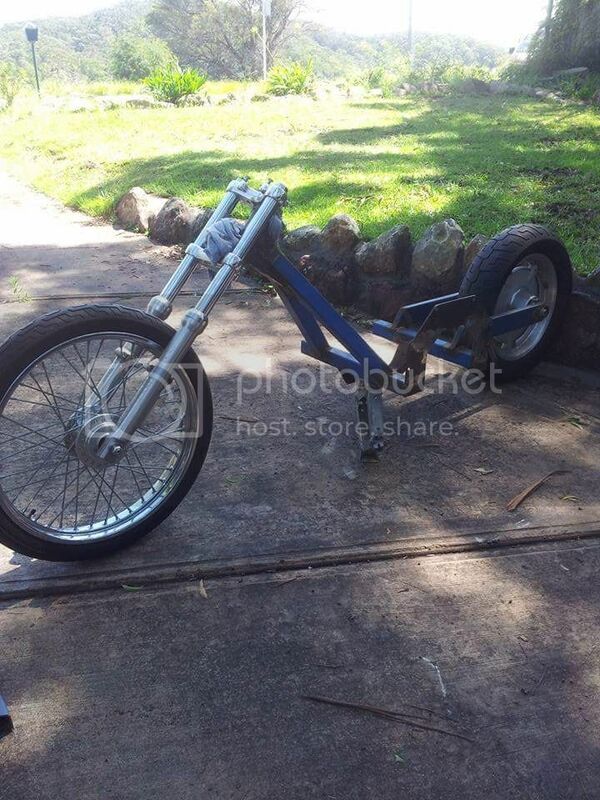 Bit shorter than your average drag bike reach once the risers are on there but not ideal for direction changes. That also will be altered slightly on the new frame. Blasted electronic interweb. Is that better? EJ Potter (aka The Michigan Madman) would have loved it. I don't have any problem with it either. We should have classes for things like this and Dion's trike too. Just because the SCTA doesn't is no reason for us not to. It would be fun to watch and listen to as it disappeared over the horizon. Just in case you were wondering, he died of old age. Boss Hoss has been making bikes in the states with V8 engines for a while. Some with Nascar Engines i believe. There's a few production V8's around including the Barbarian which is aussie made. Apparently the hoss is a little ill tempered at high speed though. EJ potter's bikes have served as significant inspiration thanks to their proven ability to do 150mph plus (superhuman rider aside). There were a bunch of other V8 drag bikes built in the 60's and 70's too, some awesome, some downright dangerous.